The right API strategy can be key to your digital business success, so choosing the best API management solution is critical - but is often challenging. Enterprises need to address a wide range of criteria depending on their digital business strategy, and you need an API management solution that not only meets your immediate needs but also supports your future initiatives. 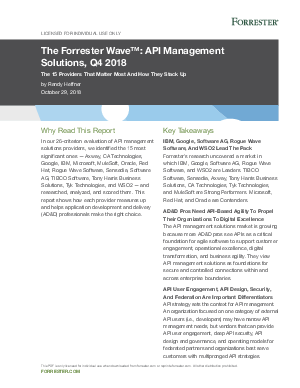 The Forrester Wave™: API Management Solutions, Q4 2018 provides an analysis of the vendors that make up the API management market and explains why Google (Apigee) is a leader.